Caviness "Pirate Pool" on reality series HGTV & DIY Network's "POOL KINGS"
Featured on HGTV's "Cool Pools"
Featured on Animal Planet's "The Pool Master"
Featured on Discovery/Destination America's "EPIC"
Find us on HGTV "Pool Kings"
Client was very open to a really fun concept. They deﬁnitely wanted a pool and spa, which is common. In the design, we put the spa in the middle of the pool. We then thought of how cool it would be to keep the spa hidden under the water level when it is in normal pool mode operation. It is only when the spa mode is activated that the water level in the pool drops 1-1/2” to reveal the glass-tiled spa and stone beam bridge that gives the client access to the spa area. This pool is actually two pools – the main body of water is 46ʼ long x 22ʼ wide with a diving end and stone covered zero-entry. To access the spa from the main body of water, you swim through a faux rock tunnel. There are stone steps to enter the spa from inside the pool as well as the stone beam pathways from the surrounding patio area. 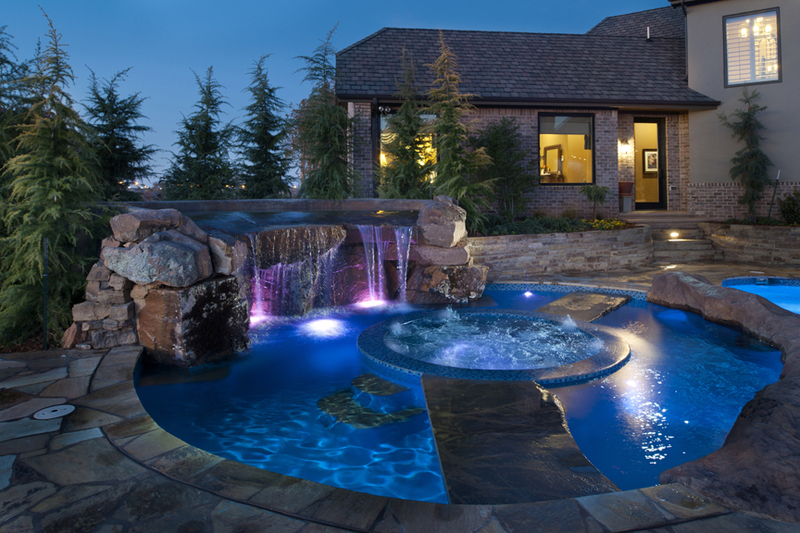 The waterfall surrounds half of the spa and can be activated in either spa or pool modes. 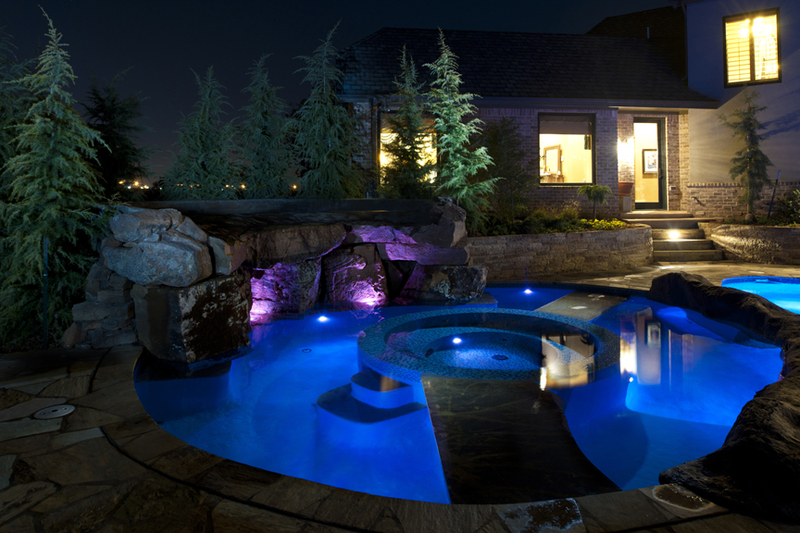 Custom Color Kinetics lighting encompass the pool, spa and waterfall areas. Elevation from the house sits at the top of a hill so we built dry-laid stone retaining walls and steps leading from the house to the pool/spa area. Mature trees soften the waterfall area and give privacy to the homeowner. All pool, waterfall, spa and lighting are controlled by a Jandy Aqualink PDA and Jandy Aqua Link RS OneTouch system.